These economical, oil-less, one-phase 60Hz piston compressors have a 1/8 HP motor, and are suitable for all airbrushes spraying properly thinned fluids. Both deliver 0.4 CFM at 20 PSI. CSA approved and UL listed. 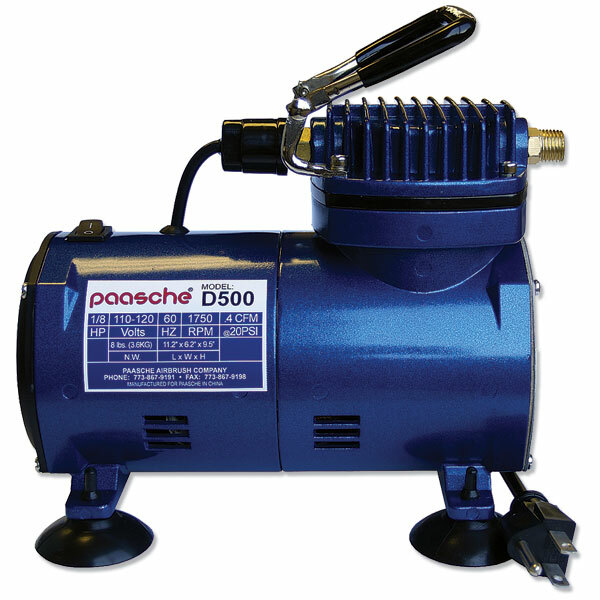 The D500 is capable of delivering 20–40 PSI operating pressure depending on the airbrush used, and delivers 0.4 CFM at 20 PSI. 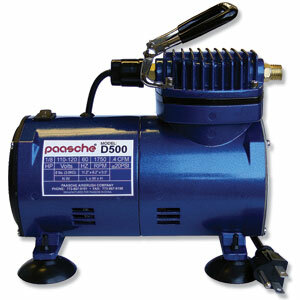 It operates on 110–120V and features a grounded three-wire cord. CSA approved and UL listed. Weighs 8 lb (3.6 kg).